One of the most anticipated SUV from Hyundai has finally arrived to steal the show. It is none other than Creta, which the company claims to be a show-stopper in the utility vehicle segment. 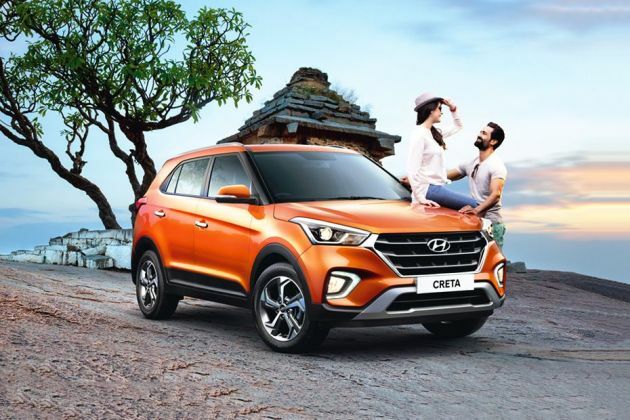 Among the varied trims offered, Hyundai Creta 1.6 CRDi AT SX Plus is one of the most featured trim in the series. Under its hood, there is a powerful 1.6-litre common rail diesel engine that is mated to a six speed automatic transmission. This SUV has the most appealing look in its class, thanks to the bi-function projector headlamps, clean silver alloy wheels and glossy black finish on its A-pillar. The insides too are attractive, as they are done up in an attractive two-tone color scheme. This is a five seater model that has several advanced comfort features incorporated in it. Some of those include a fully automatic climate control unit, smart key with push button start and an advanced audio system with touchscreen video navigation. In terms of safety, this trim gets essential features like immobilizer, impact sensing auto door unlock and ABS with EBD. To the surprise of everyone, this vehicle is available with an impressive warranty of three years without any restrictions on its mileage. The moment when it was unveiled, it has grabbed the attention of automobile enthusiasts across the country. The reason is that it has a perfect body structure with modernistic cosmetics affixed all round it. Its has an elegant front facade where it has a bold swept-back design headlight cluster that is powered by bi-function projector headlamps along with LED daytime running lights. The radiator grille looks aggressive with three slats, which are garnished in chrome. It is further embedded with the company's logo that emphasizes its elegance. The front bumper is in a dual tone color scheme featuring a black colored lower cladding along with a sporty silver skid plate. Its side profile looks even attractive, as both the A and B pillars are done up in black. This SUV also has massive fenders, which are mated with stylish clean silver alloy wheels. The external door handles are garnished in chrome, which renders a classy appeal to the side facet. On the other hand, the rear facet too looks attractive like other facets, as it has sleek taillight cluster and dual tone bumper. Like its exteriors, the insides also look soothing to the eyes, as they are done up in a beige and black color scheme. Its dashboard is the most attractive aspect featuring an edgy design central console. It is further integrated with a touchscreen infotainment system along with a few control switches. It also houses an attractive instrument cluster that offers information regarding vehicle's speed, rpm levels, notifications, fuel levels and other such features. The seats furnished inside are very comfortable, as they are ergonomically designed and are well cushioned as well. They have adjustable head restraints and reclining function for added convenience. This trim houses a 1.6-litre diesel engine that has common rail direct fuel injection technology. This 1582cc mill is integrated with a variable geometry turbocharger that enhances its overall power output. It is based on a DOHC based valve configuration that enables it to pump out a maximum power of 126.2bhp at 4000rpm that results in a pounding torque of 259.9Nm in the range of 1900 to 2750rpm. It is mated to a six speed automatic transmission that delivers torque output to the front wheels. The front wheels are fitted with disc brakes and the rear ones are equipped with the standard drum brakes. They are assisted by ABS and EBD for enhanced braking performance. Suspension of this variant consists of McPherson strut, while the rear suspension is equipped with efficient coupled torsion beam axle. Along with this, both the axles have coil springs. Being the high end variant, it hosts a lot of amenities along with all the necessary as well as luxury features. To start with, there is a smart key-less entry with push button for convenience. The external mirrors can be electronically adjustable and can also be folded as well. Power enabled steering function is offered, which also has a tilt facility to give great solace to the driver's arms. A cable type remote fuel lid opening and an electrical tailgate release too are provided for the driver's convenience. An alternator management system which charges the battery while the car is running and therefore control the power supply to the battery and reduces fuel consumption. The storage space in the compartment includes, a sun glass holder, coat hooks and back pockets to the front seats. There is an armrest to the front console, which has storage area within it. While the armrest at the rear center has a provision for cup holders. The trunk room has hooks as well as a lamp for assistance. The air-conditioning unit is fully automatic and it is accompanied rear AC vents for enhanced comfort. Rear passengers are offered with a power socket in-order to charge small electronic devices. Even the windshield at the rear is affixed by a washer and a wiper. There are visors to the driver and co-passenger, while the passenger side visor is given with a vanity mirror. All the four doors are integrated with power windows for the convenience of all the occupants whereas the driver side window has an auto one-touch up/down switch. This particular variant is integrated with an extra protection of a child seat anchor apart from other features, which are offered. The entire build is based on a HIVE body structure, which plays an eminent role in safeguarding its passengers collision impact. Dual air-bags, for driver and co-passenger are provided for minimizing the risk of injury. An anti-lock braking system along with an electronic brake-force distribution is also available, which gives additional grip over all kinds of roads. For further assistance, parking sensors are incorporated at the rear end, a steering adaptive parking guidelines display is also made available. Auto-door locks with impact sensing function helps immensely as a safety measure. An immobilizer will freeze the engine and hence avoid any unauthorized access to the vehicle. Frontage is affixed by a pair of fog lamps for clear visibility during foggy climate. Additionally, it also has a rear defogger that has a timer function to it. A lane change indicator is present for assisting the driver. 1. Being an automatic version, it is easier to drive. 1. Pricing is too expensive. 2. More work can be done to improve cabin design.